To make the sponge, in a mixer fitted with a paddle or dough hook, at medium speed, mix the sponge ingredients until totally blended. It will be a bit soupy. Pour into a bowl, cover with plastic wrap, and let sit anywhere from 12 to 24 hours. The longer it sits and ferments the better the flavor. To make the dough, place the sponge back into the mixer set to medium speed. Add the cool water and yeast. Mix for about 2 minutes. Little by little, add 1 to 2 cups of flour. Keep adding the flour until the dough begins to pull away from the bowl. You may not need to add all of the flour to reach the proper consistency. The mixing time should total about 15 minutes. This is a soft, loose dough that is a bit sticky. Mix in the salt only at the end. If you have an instant-read thermometer, it should read about 77° to 80°F. Sprinkle flour on your computer or “bench.” Put the dough out onto the counter and sprinkle a bit more flour on top. Knead for a minute and make a nice smooth ball. Gently stretch the dough out on the counter, until it forms a rectangle about the size of a sheet pan. Cut the dough into two pieces. Re-form into smooth balls and let them rest for 2 to 3 minutes. The dough is ready if it springs back when you poke it. Press it down gently with your fingers into two circles about 8 inches around. Place on a greased sheet pan. Place your desired toppings on the dough, as you would with a pizza. If you’re making the savory version end with a sprinkle of kosher salt, an herb like rosemary, and a drizzle of olive oil; on the sweet version, finish with a sprinkle of sugar and cinnamon. 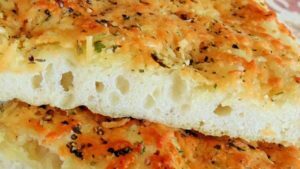 Bake the focaccia on a sheet pan or a baking stone about 20 minutes total, until nicely browned. Do not open the oven door until at least 8 minutes have passed, as the heat escaping will prevent the dough from browning and crisping properly. ** Tip**: You can make savory appetizers or sweet dessert focaccia with this recipe. The amounts and exact toppings are flexible, as indicated. Charlie Lalima of Madonia Bakery recommends using bottled water for the most consistent results.